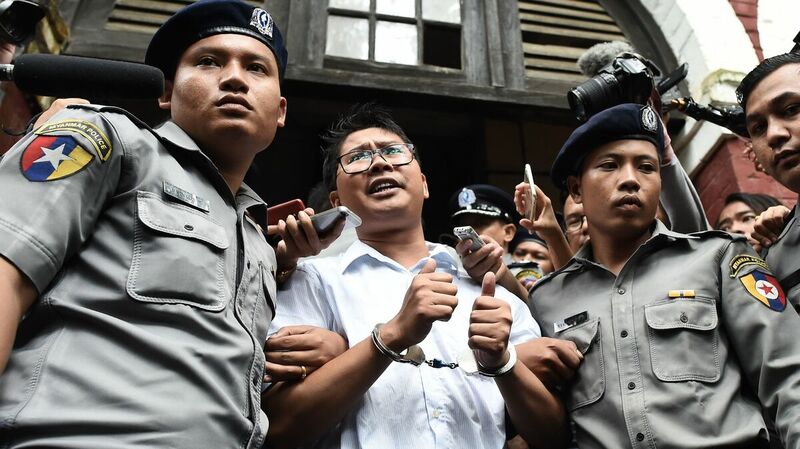 Reuters Journalists In Myanmar Convicted, Sentenced To 7 Years The journalists were convicted for violating a state secrets act. They were investigating violence against Myanmar's Rohingya. Reuters' editor-in-chief called it a sad day for press everywhere. Myanmar journalist Wa Lone (center) is escorted by police after being sentenced by a court to jail in Yangon on Monday. Foreign governments and human rights groups condemned the decision. The journalists were investigating violence against the country's Rohingya Muslim minority; a military crackdown last year sent hundreds of thousands of people fleeing Myanmar for refugee camps in Bangladesh, where many still remain. The journalists were arrested in December after meeting with police in a restaurant. They said police gave them documents, but then police immediately arrested them for possessing those documents. One police witness reportedly told the court the journalists were set up. The documents were ones they "didn't solicit and never had time to read," Krolicki told NPR. Condemnation of the verdict was swift and sweeping from human rights groups, press freedom organizations and Western governments. "Today is a sad day for Myanmar, Reuters journalists Wa Lone and Kyaw Soe Oo, and the press everywhere," Reuters editor-in-chief Stephen J. Adler said in a statement carried by the news agency. "These two admirable reporters have already spent nearly nine months in prison on false charges designed to silence their reporting and intimidate the press." Adler said Reuters may "seek relief in an international forum." "The process that resulted in their convictions was a travesty of justice and will cast Myanmar as an anti-democratic pariah as long as they are wrongfully held behind bars," said Shawn Crispin, the senior Southeast Asia representative at the Committee to Protect Journalists. The U.S. Embassy in Burma called the conviction "deeply troubling for all who support press freedom and the transition toward democracy in Myanmar." "The clear flaws in this case raise serious concerns about rule of law and judicial independence in Myanmar, and the reporters' conviction is a major setback to the Government of Myanmar's stated goal of expanding democratic freedoms," the embassy added. Britain's ambassador, Dan Chugg, said the case "struck a hammer blow to the rule of law" in the country and called for the journalists to be released. The European Union called for their immediate release, saying the conviction "undermines the freedom of the media," Reuters reported. Representatives of the United Nations, Australia, Denmark, the Netherlands and Germany all reportedly condemned the decision. Human Rights Watch Asia Director Brad Adams said the 7-year sentence "for reporting the truth is what we expect from dictatorships." Tirana Hassan, director of crisis response for Amnesty International, said it was "a dark day for democracy and free press" in Myanmar. Reuters published the results of the journalists' investigation in February, after Wa Lone and Kyaw Soe Oo were already detained. The piece reports that Myanmar troops and Buddhist villagers killed 10 Rohingya men in a remote village in September 2017 and buried them in a single grave. Aung San Suu Kyi, the country's de facto leader, has faced strong criticism over her handling of the Rohingya crisis. Last week, United Nations investigators said Myanmar's military leaders should be prosecuted for crimes against humanity and said the mass killings of Rohingya constituted genocide.